Kathleen Mae Halford was born in Ryan, Iowa on January 19, 1926 to Florence (Robinson) and Maurice Duggan. She attended school in Ryan graduating from St. Patrick’s High School. She then got her teaching endorsement at Iowa State Teacher’s College in Cedar Falls. She was united in marriage to Arnold H. Halford on July 5, 1948 in Ryan, Iowa. They celebrated 52 years together. Kathleen taught eight grades in a one room schoolhouse. She raised a family of five. She worked several years at Triangle Plastics and managed the Buffalo Creek Golf Course. 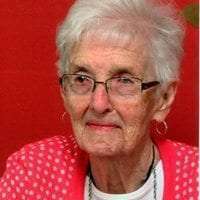 Kathleen Halford, 91, entered into her eternal rest on November 23, 2007 at Manchester, Iowa. She is survived by Dianne Halford of Houston, TX; Glenda (Bud) Barrett of Traer, IA; Colleen (Wayne) Venter of Dubuque, IA; Randy (Sally) Halford of Georgetown, TX; Patty (Craig) Cameron of Independence, IA; and Judi Halford of Terre Haute, IN; ten grandchildren: Chad (Tammy) Huntington, Michele (Ben) Roth, Clay (Juli) Cameron, Lauren (David) Rudkin, Karlyn (Jeffery) Stone, Nikki (Pat VonLehmden) Barth, Katie (Randy) Schultz, Clif (Amy) Cameron, Erin (Byron) Schalk, and Patrick (Michelle) Halford; and nineteen great grandchildren. Kathleen was preceded in death by her husband Arnold in 2001, her parents, her sister Berniece, her brothers: Lewis, Donald, Charles and Richard. Her Children would like to thank her many friends and neighbors for their friendship. Funeral services will be held at 10:30 A.M. Wednesday, Nov. 29 in St. Patrick’s Catholic Church at Winthrop with Father David Beckman officiating. Interment will be in Fairview Cemetery at Winthrop. Visitation will be from 3 PM until 7 PM on Tuesday, Nov. 28 and until 10 AM Wednesday at Fawcett Funeral Home in Winthrop.